Paul tells Scott that Gail isn't interested in him - he wants everyone to stop nagging him. Paul says he's been hurt so much he's learnt to become to detached to protect himself. Scott says he thinks Gail loves him too. He tells Paul that he's making a big mistake. 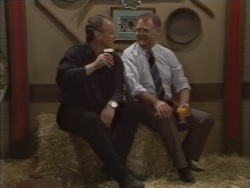 Jim and Harold have just finished putting up the Christmas decorations and sit down on some bales of hay(!) Harold congratulates Jim on his engagement. Madge walks by in colonial dress and tells Helen that the old stuff is all to impress the tourists. Helen says it's refreshing to see people celebrate their own customs for a change. Mike is trying to flog "Almost Pure Bred Labradors"(!) Henry comes out. HENRY: Mike! I've seen you out with some dogs before, but this is ridiculous! Henry sees Scott and tries to get him to take a puppy. Scott asks Henry to get orders for calendars for him. He reluctantly agrees. 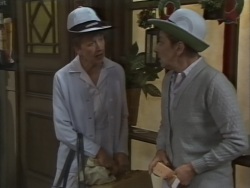 Mrs Mangel and Eilenn come up in their bowling club outfits and tell Henry and Mike off for laughing at them. Scott comes to see Gail. The house is almost completely packed up. Scott begs Gail to come to the impromptu party, but she says she has to get to the airport early. Scott offers to take her to the airport and Scott gratefully accepts. She says despite everything, she's loved having a younger brother. Scott says that Paul told him that he loves Gail, but Gail doesn't believe it. She says Paul should tell her himself, but she's not holding her breath. When Scott has gone, Gail starts to sob. Eileen is trying to flog raffle tickets for the bowls club to Jim and Beverly. Jim sees Scott and tells him off for his marraige of convenience. Paul looks contrite. Des and Malcolm come in, much to Eileen's displeasure. She tells Des off for bringing him. Des tells her he's brought him to meet some of his friends, and if Eileen doesn't like it, it's tough luck. Lucy and Mike and still trying to flog Labradors. Scott comes up and is depressed about Paul and Gail. He doesn't know what else he can do for them. 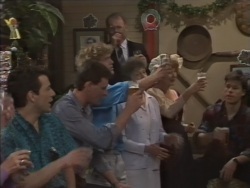 Mrs Mangel comes up and tries to flog Scott a raffle ticket, but he's had an idea and runs off. MRS MANGEL: (about Scott) Well, he seems in quite a hurry. We can only hope that he's running late for an appointment to have his hair cut! 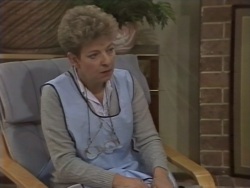 Eileen tells Mrs Mangel that she doesn't want Malcolm there. Helen goes into the back room and tells Paul that she's ashamed of him about the marriage contract - he's let himself down. 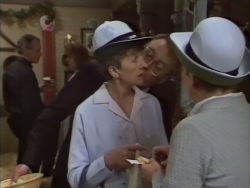 Henry tells Malcolm to kiss Eileen as well. Unfortunately there is a misunderstnading and Malcolm is knocked to the floor, clutching his knee. Gail is taking out the last of her stuff to the car. She takes a photo of her and Paul and out of a box she is leaving behind puts it in her bag. Beverly is tending to Malcolm's knee. 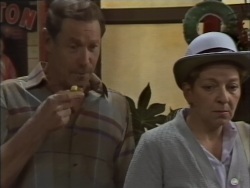 Eileen is totally fed up and bitter than Malcolm is in Des's house. Beverly says Malcolm will be off his feet for three weeks, so Des says he'll just have to stay with them. When Beverly has gone, Eileen says she'll go back to her flat, but Des says he's sick of them bickering: they're both going to stay with him and they're both going to like it! EILEEN: (sarcastically) Well! Won't this be fun! Scott has driven Gail to Lassiter's - he wants her to say goodbye to the family. Gail says she's too ashamed to face them, but Scott says that's the deal before he takes her to the airport. Eileen is fussing over Malcolm's leg and says they'll have to find a way to put up with each other for Des's sake. She goes off to start dinner and Malcolm asks if she'll do an apple crumble. Eileen says she'll try, but only because he's ill.
Tony and Henry are having an argument about Sally. But Helen says that Christmas is a time of peace, so they'd better call a truce, or leave. Gail and Scott come in. Gail says goodbye to Helen and says she's sorry for how this has turned out - her feelings for the Robinsons weren't an act. Helen says she knows and hugs Gail. Paul comes out. SCOTT: (to Gail) Isn't there someone else you should say goodbye to? But Paul wordlessly returns to the backroom and Gail leaves the Waterhole in tears. Scott strides purposefully into the backroom. SCOTT: You blew it again, didn't you? Is that how you're going to spend the rest of your life? SCOTT: You know, you once told me that you got to be a big success by taking risks. So why don't you take a chance on Gail? Paul says he's had enough and strides off angrily through the pub, passing Helen who looks hopeful. Scott and Lucy look on happily as Paul and Gail have a pash. JIM: I'm told that Gail has not taken the trip to the States, but has decided to settle here in Ramsay Street and live happily ever after! Everyone is delighted. Jim and Beverly hug Paul and Gail and everyone raises their glasses to the happy couple.